Above: Rigel Systems company logo (8,346 bytes). Rigel Systems is a small, U.S. based company that has become known and respected in the international astronomy community for having developed a number of original accessories. 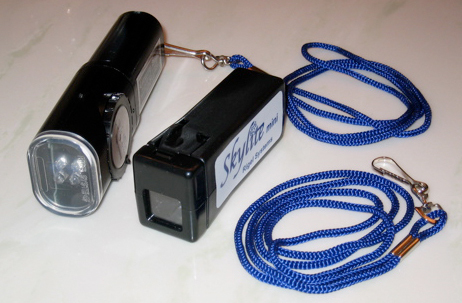 Innovations by Rigel include the PulsGuide battery powered "pulsing" illuminator, the Starlite which is the original adjustable brightness dual red LED (Light Emitting Diode) flashlight, the Skylite a white or red adjustable brightness flashlight, and the QuikFinder a compact illuminated bullseye "Reflex" sight. Their LED flashlights and the QuikFinder have found applications not only in astronomy, but also for aviation, surveillance, hiking, birding, and other outdoors uses. Why Red? Daylight as we observe it is made up of red, green and blue light in that portion of the spectrum which the human eye can detect, this region is known as the visible spectrum. This occupies wavelengths from approximately the deep violet in the shorter wavelengths just below 400 nanometers (nm) up to the longer wavelengths of the deep red at about 700 nm. The human eye evolved to help us survive in a day lit world dominated by the green of vegetation, as such it has developed a photopic (light-adapted) sensitivity that spans from about 400 nm to 700nm, peaking at about 555 nm. Since the eye is so sensitive here this is why some emergency vehicles are painted "slime lime" so that they are very obvious for example. And our scotopic (dark-adapted) sensitivity ranges from 400 nm up to 620 nm losing some red efficiency peaking at 510 nm. This is why astronomers and military working at night prefer to work in dim red light that does not cause the Iris of the eye to constrict and lose light gathering efficiency. Above: Visible portion of the electromagnetic spectrum with bordering regions (20,129 bytes). History: Rigel Systems was started in 1984 by Leon (PhD Astronomy, Ohio State University) and Linda (MBA UCLA) Palmer. The genesis for Rigel Systems was an observing trip Leon made to Kitt Peak in 1983. At that time the preferred flashlight by many professional astronomers was a compact rechargeable model made by Sanyo. This light has a compact white rectangular housing about 4 in long; it could be plugged into a wall socket to recharge the battery. A slide switch is pushed forward to turn on one of its two light bulbs, a push back turns on the other. One of the bulbs are protected by a clear plastic lens, the other by a red plastic lens. It was quite the thing to have, well almost - since the battery could not last through an entire winter night's observing! And so there was Leon at 3 am, trying to nurse another second or two out of the flashlight to read settings on the CCD camera and the telescope. This experience led Leo to wonder if red LEDs be used to make a more energy efficient flashlight. After returning from Kitt Peak, Leon started work to develop what would become the first product of what would become "Rigel Systems": an LED flashlight christened (and trademarked) "Starlite". The basic electronic features and design remain in use to this day. The electronics proved to be the easy part of the development; the hard part was the packaging ... the case. Left: Figure 1. Evolution of the first Rigel Starlite. Rigel's first product was not going to be just any other flashlight with an LED soldered into it. Leon started experimenting in Linda's kitchen, bending white Styrene plastic over aluminum frames in Linda's oven, which led to their first version (illustrated above and left) and a whole new meaning to what's cooking? They assembled about a dozen of these lights, and then made their first trip to the Riverside Telescope Maker's Conference (an annual pilgrimage ever since) where Rigel set up a card table. All of the Starlights sold within 30 minutes! Leon and Linda became convinced there was something to the idea and so Rigel improved the design (#2 in Figure 1) making Starlite a bit easier to fabricate, but not yet profitable. By July the next year, Leon had found a 9 volt battery powered flashlight at the local hardware store that could readily be adapted for their Starlite circuitry (#3 in Figure 1), this was the first Rigel light to incorporate a variable brightness control. Unfortunately, the flashlight had now been pulled from the market! Linda and Leon were able to track down the source of this flashlight and the story of its disappearance from stores; it seems that two large corporations - one specializing in power tools and the other in chemical products - contracted to make the flashlight to introduce the chemical corporation's lithium batteries. Unfortunately, after the flashlight reached the stores it was recalled because the lithium batteries had too high an internal impedance ... they did not work well at the high current drains required by the light bulb! However, everyone Leon talked to at both corporations was helpful, and eventually Rigel was able to track down a warehouse full of the recalled flashlights and arrange to start buying them in 1000 piece lots (Rigel still has 5000 light bulbs in their garage). There are two morals to this story; (1) one man's lemon is another man's lemonade, (2) big corporations can be friendly and helpful even to small guys. Rigel finally started making money with the 9 volt version, especially when red LED technology became 10 times brighter. Within a couple of years Rigel had a fair number of dealers and as the supply of the recalled flashlights dried up, they could afford to have plastic injection molds fabricated, and save Leon from any future table saw related hazards. This is the version of Starlite that most amateur astronomers have, #4 in Figure 1. Within a couple of years of #4's introduction, white LEDs came on the market, something Rigel had anticipated ever since introducing the original Starlite. Rigel quickly reintroduced their original concept of a two-color LED flashlight and christened it Skylite. And about this time all the other colors of the LED rainbow were becoming available as bright as the red LEDs had been almost a decade before, so Rigel started offering other colors of LEDs in their flashlights as specialty items. Company Seven was first introduced to Rigel products through the PulsGuide battery powered "pulsing" illuminator, when it became available to us through Lumicon, one of our associates in the astronomy community. This unique battery powered illuminator was provided for use with the Lumicon Guiding Reticle Eyepiece, and later with other distributors products too. Right: Figure 2. The Rigel Systems Starlite II and Starlite mini. Since then, Rigel earned even more respect when their Starlite was selected for distribution by several companies including Celestron International; the Starlight was a real improvement in terms of practicality, efficiency, and reliability over many previous offerings. Company Seven employees came to choose the PulsGuide and the Starlite, and since then the newer dual red and white LED Skylite II and Skylite mini. BeanCounters Impact Sourcing Company Seven was content to buy Rigel products from middlemen since it was convenient and our profit had never been the over riding concern. However, since the introduction of the original Rigel Starlite, some distributors of the Rigel product began cutting costs by sourcing copies of the U.S. developed products from low labor cost third world countries. The imported items are obvious mimics of the U.S. or Japan made originals, usually retailing for the about same price as the original U.S. made product but netting the importer the profit. Company Seven's Response This practice of taking innovative concepts to overseas and then cloning it at the expense of the originator of the idea, with no real improvement to the product by the cheaper source is in our opinion shortsighted. This has eroded our respect and confidence in the management of those companies who make such choices. And so Company Seven has since elected to offer our support to the innovator in this field - Rigel. We have discontinued other LED lights and now buy directly from Rigel, and we urge those companies who partner with Company Seven (Orion, etc.) to do the same. After all, we perceive "profit is the reward for a job well done" and Rigel has done their job well.